There is out a new taste of the brand Corset, it's Mint Breeze with 6 mg tar and 0,6 mg nicotine - the bar-code is 3800221 963866 and it's made by King's TObacco International. 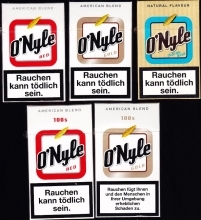 Another brand with additive free tobacco is Benson & Hedges ohne Zusätze with 6 mg tar and 0,6 mg nicotine, the bar-code is 9036 8554 and it's made by JT International. Memphis Classic is out with another special edition of 4 packs. A former worker of Austria Tabak founded in Austria the company Tschikfabrik and the first brand is Tschik which is a Viennese slang-word for cigarette. The brand has tobacco from Zambia and is produced by Polish company Orion and sold by Moosmayr (probably only) in Austria. There exists Tschick Rot with 10 mg tar and 0,8 mg nicotine, the bar-code is 9008122 000836 and Tschick Blau with 8 mg tar and 0,6 mg nicotine, the bar-code is 9008122 000343. From the company Planta Berlin is out the brand Black Vanilla in a new design. This brand was already for sale in Austria, now not only the design has changed also the cigarettes are with natur cover and that's why they are called Cigarillos now. From the same company there is out in same style and also called Cigarillos the brand Wild Cherry.